Visions of sugar plums may be dancing in some heads this holiday season, but for many gardeners, those visions are more like sugar-plum-colored flowers and new foliage plants. 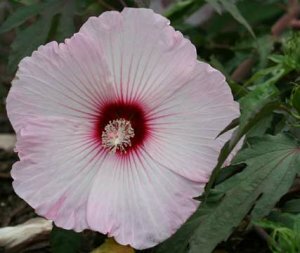 If your winter reading consists of nursery and flower catalogs, here’s a new variety you might want to check out: the ‘Hypnotic’ Hibiscus. Few plants tolerate such a wide variety of growing conditions as the hibiscus, and at a maximum height of under 4 feet, this pale pink beauty can fit just about anywhere in your landscape, to provide a backdrop for other similarly-colored or contrasting flowers. How about pairing it with some deep maroon blooms? Happy floral dreams!